I hardly ever watch TV and occasionally I miss some great stuff (though usually not). Fortunately in one special case just now, my mother thought to give me a call to tell me about a great story she saw on 60 Minutes yesterday. It's about an amazing inventor and aviator named Forrest Bird. Bird's most successful invention was the modern respirator. It is still in widespread use and has saved many, many lives (including an infant respirator called the BABYbird). At 86 years old, Bird still works a 12 hour day and spends a lot of time flying his airplanes (he has 21 including three helicopters). He's been flying for 75 years and can still pass an FAA medical - wow. He flies solo in his Piper Cub and other fixed wing aircraft (in one scene he was flying right seat in a helicopter, so I suppose there was another pilot in the left seat - but he's flying helicopters at 86!). Thanks to the internet I was able to watch the story just now (at the cost of ignoring one Viagra commercial). It's really inspiring to see this guy's zest for life. Note: The video now embedded here is the full "60 Minutes" episode from 8/30/09 (the individual Birdman segment is no longer available on the CBS site). The Forrest Bird segment starts at about 27 minutes in the 42 minute video. You can also watch the video of this segment on the Bird Aviation Museum and Invention Center web site here (no Viagra or other commercials!). The museum is located near Dr. Bird's home, near Sandpoint, Idaho. Carnival of Space #118 is now open for viewing at Stuart Atkinson's Cumbrian Sky blog. Stuart has provided nice summaries of the contributed posts along with some artfully edited images from the Mars Reconnaissance Orbiter. I especially liked Nancy Atkinson's Universe Today post on spacecraft navigation for which she interviewed several professional spacecraft navigators. When I was in high school and even for a while in college (where I was eventually a physics major), this was a job that I imagined myself doing someday. I ended up in optics instead, but I remained interested in space and orbital mechanics and was finally able to do something fun with that interest when I discovered the free Orbiter space flight simulator in 2005 and wrote the tutorial book Go Play In Space (also free). The shuttle Discovery (STS-128) docked with the International Space Station today, on the 25th anniversary of its first launch (STS-41-D, August 30, 1984) - that's amazing in itself! 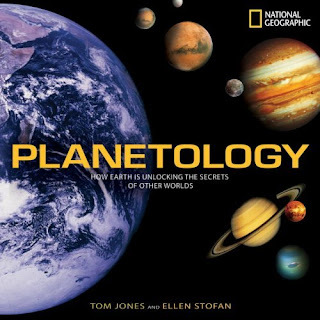 I haven't been following this mission very much this weekend, but I have been reading a very good 2008 book by former astronaut Tom Jones and planetary geologist Ellen Stofan, Planetology (subtitle: unlocking the secrets of the solar system). Jones is a planetary scientist who flew as a mission specialist on four shuttle missions from 1994 to 2001 (his memoir Sky Walking is excellent). His first two flights in 1994 were Space Radar Laboratory missions, which used special imaging radar to map the surface of the Earth. Some of his "ground truth" training for that mission featured geology field work that also included his co-author, Ellen Stofan. I'm trying to save money and shelf space by using my local library more, and I happened to find this book there last week. The cool thing about it is that it is not your typical solar system tour coffee-table book, with a profile of each planet from Mercury outward. Instead it takes a functional and comparative approach, looking at water, volcanoes, tectonics, wind, etc. on Earth and on the other planets and moons. This takes advantage of our extensive knowledge of the Earth which can be compared with imagery and other data from our various probes. It's very up to date, well written, and profusely illustrated. The authors have done a good job writing for a general audience, but their approach reflects the way the science is actually done more than many books "about the solar system." The only problem will be convincing myself to just read the library copy and not buy a copy for myself! One of the coolest things we did in Seattle this past week was a 20 minute seaplane tour. We flew with Kenmore Air, which flies a fleet of seaplanes for scheduled, charter, and sightseeing service all over the Puget Sound region. We flew a De Havilland DHC-2 Beaver, one of the coolest planes ever. I requested and got the front right seat for the flight (there were only four passengers - the Beaver can seat six plus the pilot). 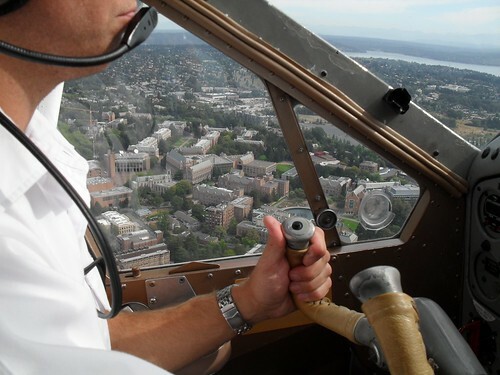 We took off from Lake Union (a 20 minute walk from our hotel near Seattle Center), flew east over the University of Washington and Lake Washington, then headed south along the eastern shore of the lake to Medina, where we saw Bill Gates' famous lakeside home (I missed it so I asked the pilot to circle back). Then we headed west for downtown Seattle, flying over the two sports stadiums (Safeco Field and Quest Arena, I guess) and then northwest along the Puget Sound waterfront. We got a good view of downtown Seattle, the Space Needle, and the Seattle Center area before turning southeast and back to land to the south-southwest on Lake Union. I was trying to enjoy the scenery, take pictures, and take in some of the pilot stuff, and it more or less worked. I sort of wish I could have heard the air traffic control for the pilot experience, but it was nice having the prerecorded sightseeing info (which must be GPS-driven because it seemed to know where we were even when Todd circled back to show me Bill's house). I plotted the approximate route on the map below. More pix on Flickr. This is supposed to be a space blog, though you might not know it from my last few weeks of posts. But in the September 2009 issue of Discover Magazine, I just read a great article on plans for the exploration of Jupiter's moon Europa. The likely presence of an enormous ocean of liquid water below Europa's icy surface has many people wondering about the possibility of some form of life there. The missions under study would not directly detect life, but would gather more information about Europa's environment and surface and use ice-penetrating radar to determine how thick the ice layer is and perhaps even directly confirm the presence of water. The 2020 Europa Jupiter System Mission is estimated to cost $4 billion (for NASA's part) and would be coordinated with a separate ESA probe to the Jupiter system, though the funding for both parts of the proposed mission is hardly certain at this point (NASA's probe would orbit Europa, ESA's probe would orbit Ganymede). The Discover article is already online, and there's a great Science Channel video based on the article here (and embedded above). There's a NASA/ESA "joint summary" report here (PDF 10 MB, 38 pages, January 2009). If you'd like to do some exploration of the Jupiter system for yourself, you can use the Orbiter space flight simulator as I did back in April when I was preparing for my first IYA podcast. In that podcast, I started out by imagining that I was orbiting Europa and then initiated a transfer orbit to visit Callisto. I simulated that mission in Orbiter so I could talk about what I would see if I really took such a trip (assuming I could survive the radiation). 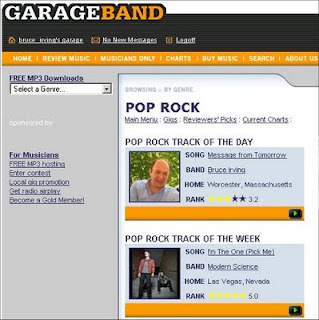 Today my song "Message from Tomorrow" is the pop-rock Track of the Day on Garageband.com. That and $2 will get you a ride on the Seattle Monorail (more on Seattle in the next few days), but it's better than not being the Track of the Day. The song has gotten somewhat mixed reviews with a current rating of 3.2 out of 5 stars, ranked 191 out of 274 on the pop-rock chart, but some of the review feedback has actually given me useful ideas for when I do final recording and mixing for this track, which is my main goal when I put songs up on GB. Another song from the new album is up there too, "Achin' All the Time," and it's actually doing better than "Message from Tomorrow," which surprised me a bit because I thought "Message" was a much stronger song ("Achin'" is #152 with a review average of 4.4 out of 5). There's been useful feedback on this one too, mainly that the chorus is not distinct enough, so I've rewritten the melody and lyrics a bit for when I do final vocals on that one in the next few weeks. 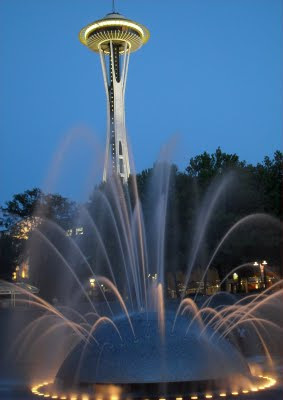 I'm in Seattle this week, on vacation and collecting new experiences at an amazing clip. I thought I might mention this since Kevin Thompson gave my blog a plug the other day on his blog, Idle Diffractions (thanks Kevin), and I figured it would be nice to have written a post newer than August 11. 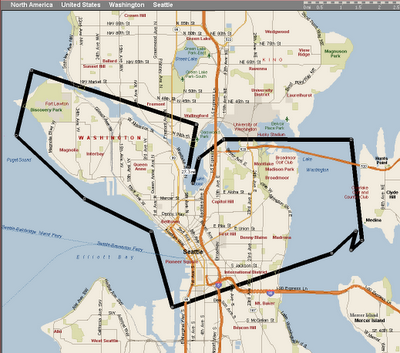 So here it is, a sort of smorgasbord blog post from the Great Northwest. One of my experiences was a full-motion simulator ride today at the Museum of Flight which was very cool. I was flying a simulated F-15. This was only the second time I've experienced a simulator that actually turns you in any direction (including upside down) as part of the simulation, and it was great, especially on the loops and barrel rolls. Other experiences this week have included Paul Allen's (EMP) rock & roll museum and SF museum, and tomorrow I'll be taking a short seaplane flight. I also did a little real (C172) flying recently back in Massachusetts, and with the extensive work I've been doing on my upcoming album Message from Tomorrow, you can see that I've really been doing my best to live up to both parts of my nom-de-web (FlyingSinger). 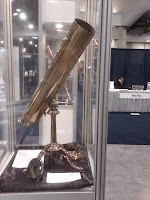 Finally, I'd like to mention that while in San Diego the first week of this month for SPIE, I did manage to see the great historic telescope exhibit that Kevin raved about in one of his posts. It was indeed an amazing collection of historic optical instruments. I even got someone to take a couple of pictures for me, one of which is here (thanks, Dave). My experience tanks are nearly topped off (I've also read a few books this summer) and I hope to return to more regular blogging starting in September. According to this article, NASA is looking for a "space taxi," or more accurately, proposals for a commercial passenger transportation system to space. They plan to use $50 million of economic stimulus funds as "seed money" for this program. Such a system could help fill the gap in astronaut transportation to the ISS between the 2010 retirement of the space shuttle and the 2015 (probably later) availability of the Orion spacecraft and the Ares I launch vehicle (or whatever NASA ends up developing after the Augustine NASA Review Panel makes its recommendations). The current plan is to buy seats on Russian Soyuz spacecraft at $50 million a flight until a US-based system is available. It would seem that SpaceX has a leg up on this program with its private Dragon spacecraft program, currently in development (with some NASA funding) to carry cargo to the ISS. Dragon was designed from the start to be extended to carrying passengers, with the addition of a few critical parts like seats and a crew escape system. But the escape system is a big ticket item (estimated at $300 million to develop), so $50 million won't go very far, assuming SpaceX wins the competetive bid. But as Elon Musk says, at least it's a step in the right direction, calling people's attention to the post-shuttle gap. Of course it's not likely a real "space taxi" will look like my picture. 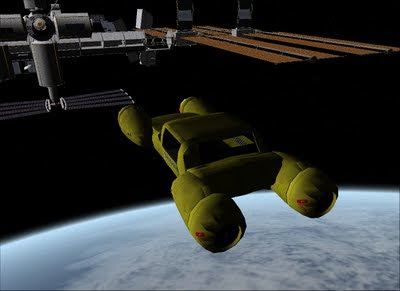 This is an Orbiter add-on called "Space Taxi 2" by "lumpiluk," inspired by a German movie. I'll make it brief (this is unprecedented! and no pictures!). The latest carnival of space is now online at New Frontier News. 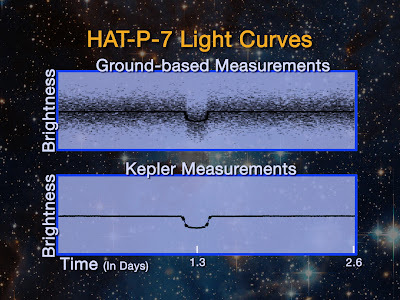 NASA's new planet-hunting Kepler space telescope has detected the changing phases and atmosphere of a planet a thousand light years away(the NASA figure above shows a comparison of ground-based and space-based light curves for hot exoplanet HAT P7b). This "hot Jupiter" exoplanet had already been detected with Earth-based measurements, but Kepler was able to measure a more precise light curve for the planet, allowing scientists to infer an atmospheric temperature (about 2400 C) and to determine that the planet's orbit is circular. This was intended as more of a calibration of Kepler's capabilities, but even at this early stage of the mission, it was able to return useful new information for this previously known exoplanet. Kepler is looking at thousands of stars in a fixed region of space and will be able to measure similarly precise light curves for all of the stars it will be "staring at" for the next three years or more. A fraction of those stars are expected to have planets in orbital planes oriented to allow Kepler to detect the slight dimming of the stars' light as the planets pass in front of them. The Galileoscope is a special low-cost refracting telescope kit that is being distributed as part of the International Year of Astronomy (IYA). Galileo used a simple refracting telescope 400 years ago to observe the craters of the Moon, as well as the phases of Venus and the moons of Jupiter. IYA 2009 recognizes this important 400 year anniversary. 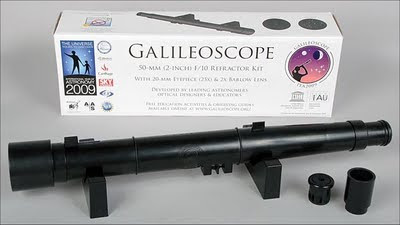 The Galileoscope is not a replica of Galileo's telescope, but rather an easy-to-assemble kit consisting of a 50 mm glass achromatic cemented doublet objective (way better than Galileo's objective lens) and a couple of eye pieces with plastic optics that can be used in three ways. It also includes the tubes and other parts required for assembly (no tools are needed). The basic eyepiece is a Plössl type and provides 25x magnification. There's an auxiliary eyepiece with a negative lens similar to what Galileo used. Its field of view is so small that it's like looking through a soda straw, so the main use of this is to show how bad Galileo had it when he made his early discoveries (though his view was even worse than this). But this eyepiece can be combined with the basic eyepiece and the included Barlow extender tube to provide a 50x eyepiece that works pretty well - good enough to clearly see the rings of Saturn, they say. I just got a Galileoscope today, assembled it, and tried it out on some nearby trees and buildings. It works quite well, providing clear and sharp views, though the friction-based focusing is hard to set precisely. I haven't tried it on the night sky yet - maybe tonight. The Galileoscope has been available online for $15 plus shipping, but the price is going up to $20 effective August 10 (their production and shipping costs were higher than expected). This is still a good deal for a telescope of this quality. The instructions (2 pages) that come with it are quite minimal and even a bit confusing, so I recommend that you download the expanded instruction PDF (7 pages with color photos) from the web site. There's also a nice 20 page PDF Galileoscope Observing Guide available for download. Assembly is easy, but you should look carefully at the shapes and orientations of the plastic eyepiece lenses. There are several different types, and they have to be assembled in a certain order and orientation. They look very similar even though they have different curvatures and thicknesses. One tip: the negative lenses (thinner in the middle) will make distant objects look smaller and right-side up when you hold them a few inches from your eye. The positive lenses (thicker in the middle) will show an inverted image when held up that way. Look carefully to determine the flat vs. curved (convex or concave) sides of the lenses. If you assemble an eyepiece wrong, things won't look quite right, but don't panic - you can easily take it apart and try again. No screws or glue are used in assembly. Just handle the lenses carefully by their edges to avoid fingerprints. What if you used the equations of gravitational motion to make music? What would that sound like? See for yourself with Kepler's Orrery, "a generative music system that uses gravity equations to compose and play ambient music." I was actually searching for a web site on building an orrery out of Legos (to simulate the detection of exoplanets as done by the Kepler spacecraft, as I saw the other night at Starfest) when I found this application created by artist Simran Gleason. It runs as a Java applet and is also available for the iPhone and iPod Touch (I just downloaded and installed it, 99 cents). The Java version actually gives you more controls such as choosing which MIDI sounds will be used, though the iPhone version is more interactive (you can play god and toss massive gravitational objects anywhere you like with your fingertip). It isn't strictly Newtonian (and it's not General Relativity either). The author injects elements of randomness, anti-gravity, and friction to avoid overly repetitive music that might take 365 days to play. You can read about how he does it here - it's pretty much doing the same thing that Orbiter is doing when it runs a space simulation, figuring out all the forces acting on each object in the "world" at each time step, calculating the accelerations and collisions, moving the bodies, and repeating. It's just that instead of Apollo 11 landing on the Moon, you get music! The video above is one example of the kind of sounds it can produce (more here). I've only played for a few minutes and now I need to get to bed, but I really like this little gravitational music toy. Starfest 2009 went really well last night, thanks to the contributions of many volunteer members of the Aldrich Astronomical Society, not to mention some amazingly clear skies. The Moon looked a lot like the picture shown here (thanks to KCrawfish03 on Flickr for this shot). 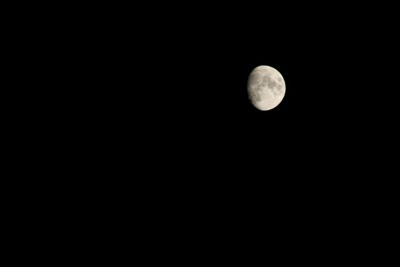 It was bright, but pretty low in the sky, so it allowed for some great Moon viewing and also allowed some other sky objects to be seen quite well by our telescope viewing guests once it got dark around 9:30. Before that, we had some really cool presentations in several classrooms at Anna Maria College. I started out as a greeter, helping to explain the options to visitors as they arrived (they had to make some choices since we had a lot of presentations and activities to choose from). I then attended a really nice presentation on the Kepler mission to detect Earth-like planets orbiting other stars. Kevin Boucher's presentation included a demo using a Lego model of planets orbiting a light bulb "star" with a photodetector connected to the PC to graphically demonstrate how Kepler detects planets by accurately tracking the light output of some 100,000 stars. My presentation "The Once and Future Moon" featured a small pep talk on how, yes, we really did send astronauts to the Moon from 1969 to 1972, including some recent pictures of the Apollo landing sites taken from the Lunar Reconnaissance Orbiter (it's a shame that you still have to talk about that, but Moon hoax conspiracy wackos are still out there). But the main event was a very noisy simulated Saturn V launch in Orbiter, followed by a simulated Apollo 11 Moon landing. The kids (and adults) seemed to really enjoy that, especially when Neil said "the Eagle has landed." Then it was 9 o'clock and I sent them all to get their telescope etiquette briefing so they could go look at the Moon itself through the telescopes behind the science building. I don't know how many guests we had, but it seemed like a lot of people, and they seemed to all be having a pretty good time. A colleague of mine has launched a new blog, focused (as it were) on optics, Idle Diffractions (it's sponsored by the company we both work for). Kevin Thompson is ORA's vice president of engineering and he's a really interesting guy with over 30 years of wide-ranging optical design experience. He also collects optics books including some really, really old ones, and he has a corresponding interest in the history of optics and optical design. His first post talks about the Hubble Space Telescope, a subject on which he has some personal experience. Kevin plans to write more on the Hubble and on many other aspects of optics old and new in the weeks and months to come. 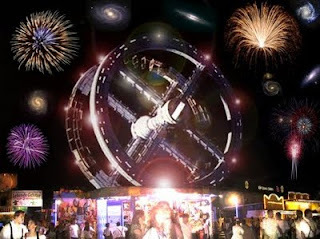 One of these weeks I'm going to run away and join the carnival (of space) again. It's been a while for me since I've been preoccupied this summer with various non-spacey things. But the rest of the space blogosphere has carried on, as you can see from this week's Carnival of Space #114, hosted by Cheap Astronomy.